Some users experience problems with the commonly available mass-produced reproduction rotor arms. 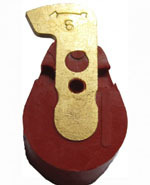 This upgraded product is produced with a brass inlay which eliminates the rivet which can cause short-circuiting. Improved insulation properties make the rotor ideal for use with standard and high-performance sports coils and the revised underside clipping arrangement assures a good fit even on worn mountings.